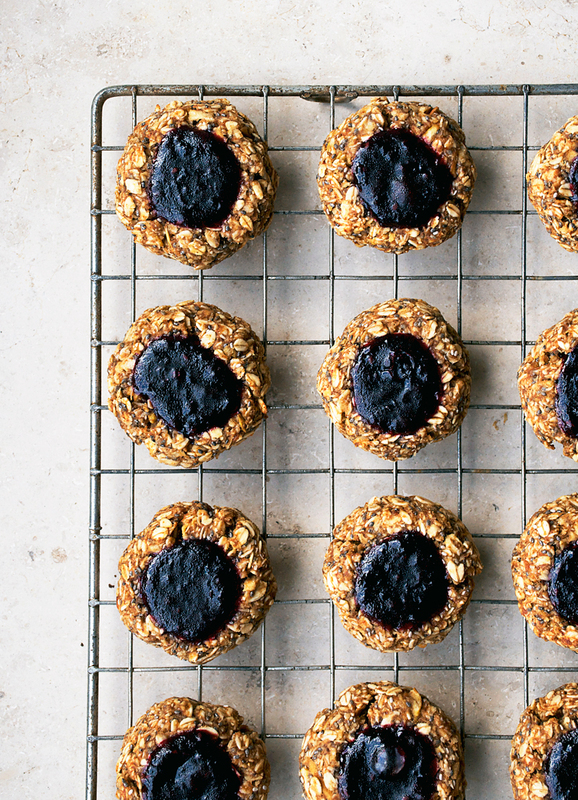 Gluten free oatmeal thumbprint breakfast cookies filled with blackberry jam make a nice autumn treat. These sugar free cookies are sweetened with apple and dates, and they’re vegan to boot. Hello from Germany! We’re almost settled now (in other words, I finally got around to doing some laundry) but I still don’t have my computer, and we just got the internet hooked up in our apartment today. My computer, which cost an arm and a leg to ship here, was detained at customs in Frankfurt, so I have no idea when I’ll be getting it. I have piles of work on there so I’m a little worried about that. Apart from that everything has gone well so far with our move. Our apartment is kind of huge and was clearly decorated by a wealthy older lady (gold/brass accents everywhere) and it has massive windows, a great kitchen, and overall it’s really nice. We’ll only be here until November but until then it’s good to have a home base, and especially a nice bright one. There’s a huge ledge in front of the window in the living room and I’ve been using that for almost all of my pictures so far, since I don’t have any backgrounds and hardly any props to use in photos. It’s nice limestone, but be forewarned that my pictures are all going to look pretty similar over the next few weeks. So far my grandmother has been here almost every day, or we’ve been at her house in the country. One of the reasons for moving here, the main reason, was to see more of my family, so we’re certainly doing that. She doesn’t cook much so she’s taking advantage of my constant cooking, ha. Yesterday she came over for dinner before choir (adorable) and watched me take pictures of a pasta recipe before we ate. It’s the most wonderful thing to be able to see her as part of my daily life. That being said, it’s hard not being able to have my mom in my life as much now. It’s always difficult to have family in two very different spaces in the world and being so far apart. I think we’re going to enjoy our time here, though. The first thing I made in our new apartment was a version of these thumbprint breakfast cookies. We didn’t have very many groceries, but I had picked some apples at my grandmother’s house and wanted to make something out of the sparse pantry (my cupboards are much fuller now). I just had quick-cook oats, a few dates, and a small jar of coconut oil. I’ve improved the recipe since that first attempt, and haven’t been able to stop eating these little breakfast cookies since. I could take or leave my first try, but these are so good. The earlier ones didn’t have jam. My godmother makes oodles of jam and gave me some blackberry jam, so when I tested the recipe again I ended up making these thumbprint breakfast cookies and filling them with it. 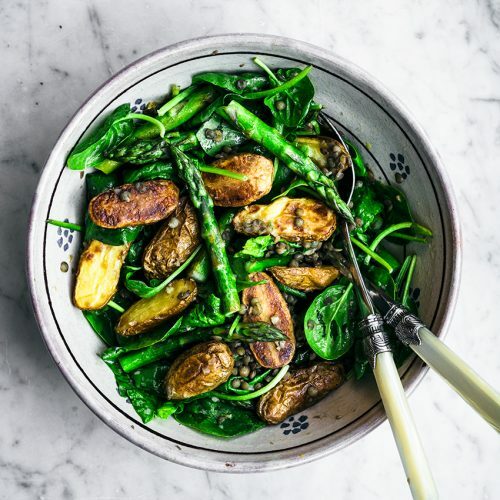 The ingredients have remained simple and straightforward, and hopefully you have most or all of them already in your house. I tried my hardest to make these without chia, but they just wouldn’t hold the thumbprint shape without falling apart and I ended up adding some to make the cookies work. The blackberry jam could be replaced with raspberry if that’s easier for you to find, but definitely look for something that isn’t extremely sweet or even just make some speedy chia seed jam (definitely go that route if you’re looking to keep these free of added sugar). 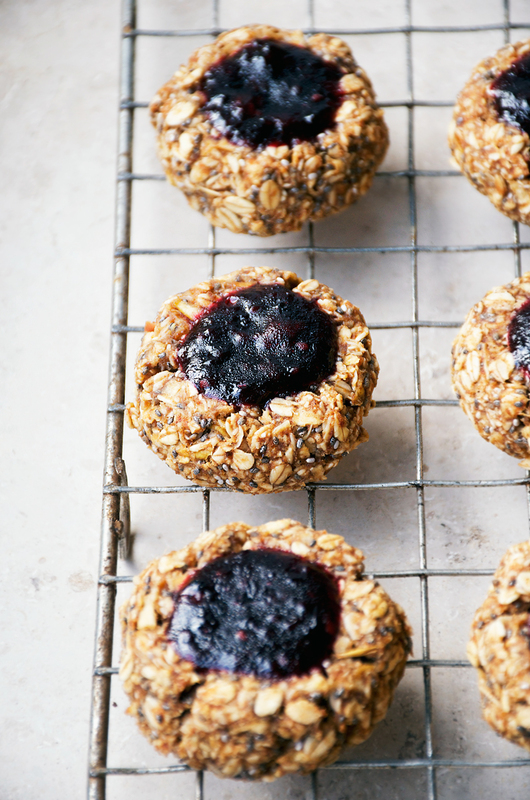 This recipe is naturally gluten-free and made just with oats, as well as being sweetened only with fruit and vegan. I’m not sure what kind of apple I used in this recipe, but I imagine any type will work. If you’re in the northern hemisphere look for local apples now – they’re so much better than the imported ones, and apple trees are all over the place. Get them while they’re cheap, since that’s also when they taste best! I’m also switching to include metric measurements/weights in recipes now, so if you prefer to cook and bake that way, the option is here. And if you’re looking for some more breakfast inspiration, check out my archives – there are lots of sugar & gluten free ideas there. 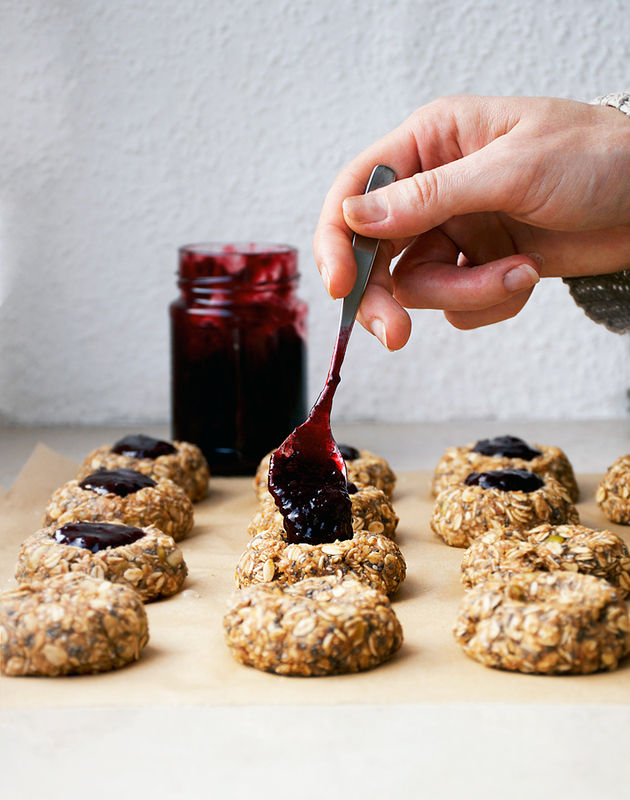 Gluten free oatmeal thumbprint breakfast cookies filled with blackberry jam make a nice autumn treat. These sugar free cookies are sweetened with apple and dates, and they're vegan to boot. Preheat your oven to 175C / 350F and grease a baking sheet or line it with parchment paper. Place the oats, chia, cinnamon, baking powder, nutmeg, and salt in a large bowl and stir to combine. 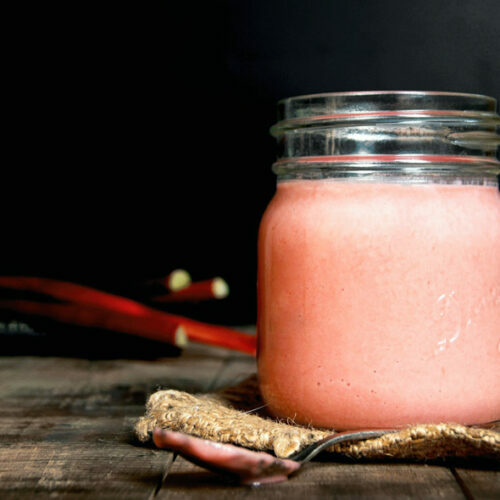 Blend the dates in a food processor until a smooth paste forms, then add the milk and oil. Blend again until everything is fully incorporated. Add the date mixture and the shredded apple to the bowl with the dry ingredients and mix until the dough sticks together easily. You will likely have to use your hands as it's difficult to mix. Form approximately equal balls of dough, about 2 tablespoons per cookie. Place on the cookie sheet (they won't spread so don't worry about leaving too much space between them) and use your thumb to make an indent in the centre of each cookie. You may need to gently push the sides back into place after making the thumbprint. 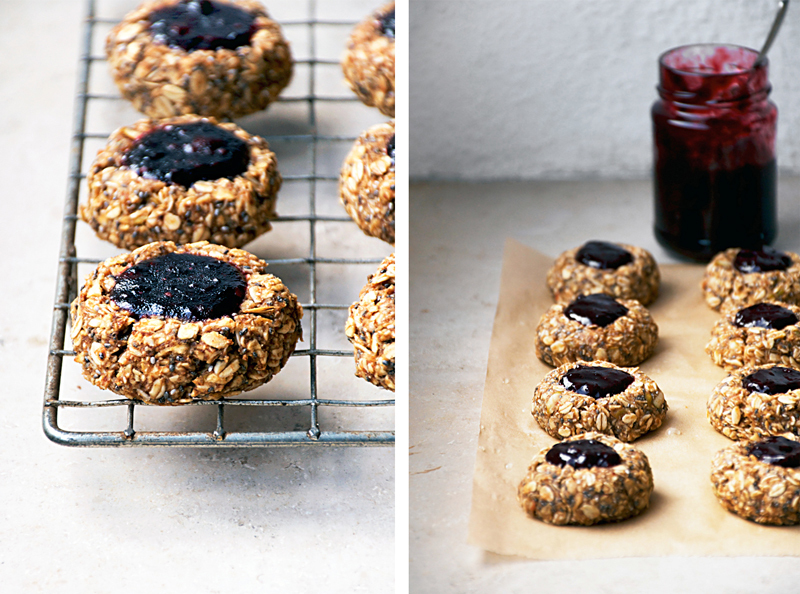 Fill each thumbprint with a teaspoon of jam, and bake the cookies for 10-12 minutes. Remove from the oven and cool for ten minutes before moving them to a rack to cool completely. Store on the counter for up to three days or in the fridge for a week. P.S. 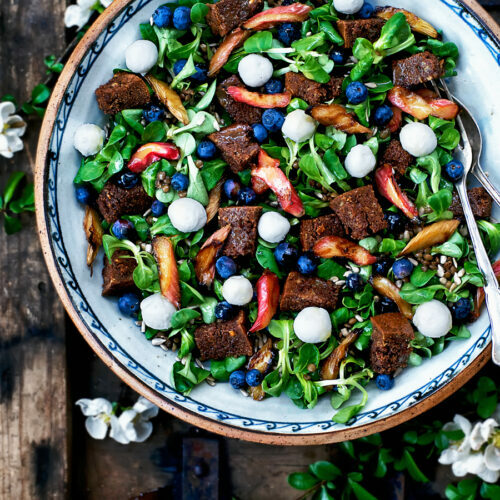 My lovely friend Traci of Vanilla and Bean has just released her first e-book! 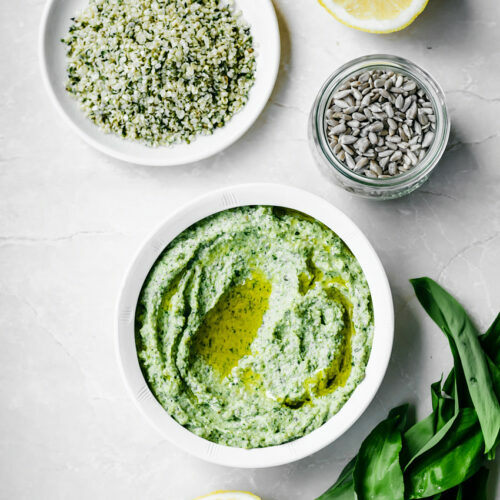 It’s all about easy, healthy snacks and I promise that the recipes are delicious (I was one of her testers!) as well as being totally refined sugar free, gluten free, and plant based. You can get the book here. These look amaaaazing! I love how they're sweetened with dates and that there's apple baked in. Gorgeous pictures, as always, and your new space is lovely! No props or surfaces needed. This looks like my kind of cookie. Definitely pinning this to make this weekend. Your new apartment sounds fantastic and your photographs look great! Beautiful cookies and tack sharp photos. I can really see how they taste: crunchy and not too sweet. My kind of cookie. Great job. What delicious looking thumbprint cookies…I'll take a dozen please? I LOVE apple and blackberry together. And there's just something so lovely about thumbprint cookies! Also, definitely making these cookies this weekend! Thank you, Sofia! <3 I actually went to my uncle's a couple days after posting this and he had three different types of large tiles lying around, so I have a few new ones anyway! Thank goodness for family, right? Ooh, good, I hope you like them! Thanks, Kimberlie 🙂 I love not-too-sweet cookies too. Thinking of you, sweet Sarah! It's here now (I'm typing this from that computer) and I bet it's 90% due to your excellent packing skills. Let me know how they turn out! I love these wholesome cookies, Alexandra. I wouldn't have thought to pair blackberry and apple, but it seems like a great marriage to me! Can't wait to try (and thanks for the head's up about Traci's book — I love her work). Goodness, Gena, thank you! It's so great to hear something like that from someone I so admire. Adorable and so darn fall! 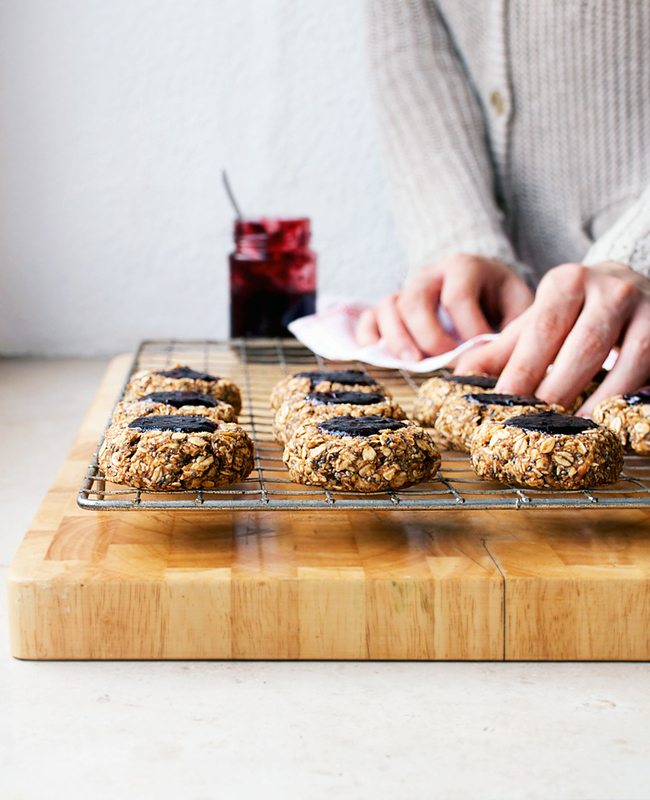 Love me a good cookie recipe… this one's definitely being added to the "gotta try" list!